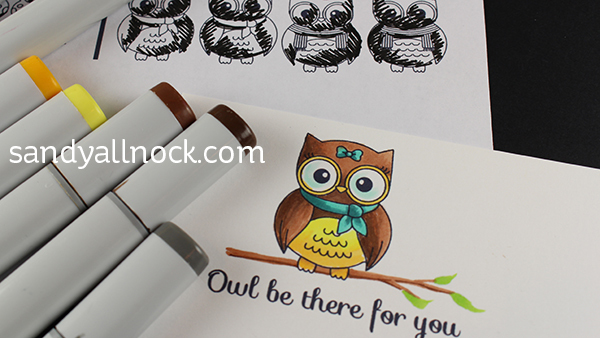 My Wednesday post arrived early….because MFT is releasing this sweet little Stacey Yacula stamp set and I couldn’t resist joining the party! 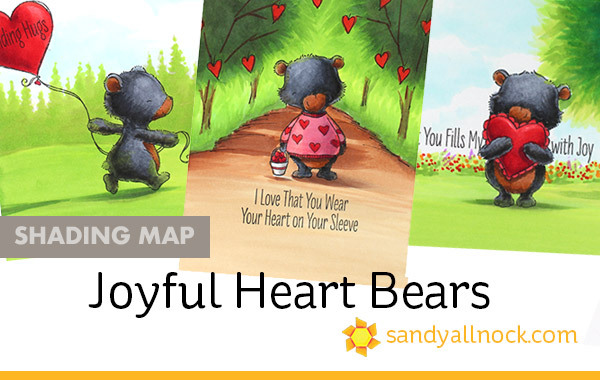 I’ve created shading maps for the three Joyful Heart Bears – with the light different for each of them. Soon there’ll be a new Casting Shadows class ready – and I’m hoping that class will explain shading in enough depth that people will start to internalize it! 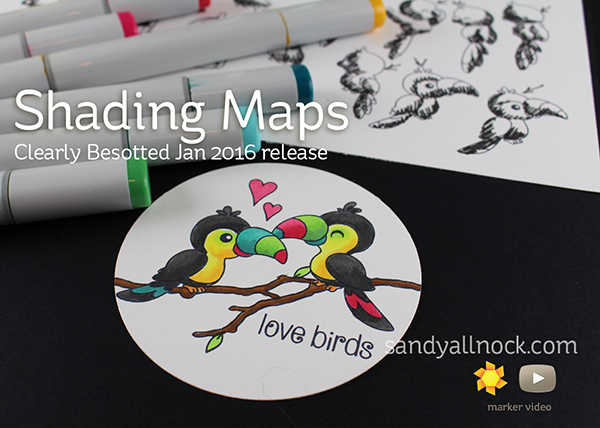 But….shading maps can help in the meantime….pin away! You can click on the image to enlarge it, but be sure to pin it from the smaller image so people on Pinterest can make their way here to see it. 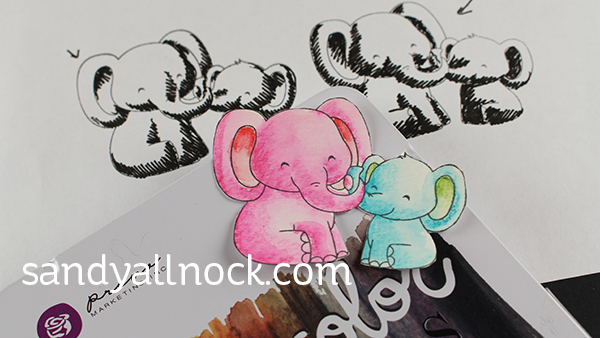 I added backgrounds to each of my little colored stamps….this little guy is in his garden hugging and squeezing and loving! 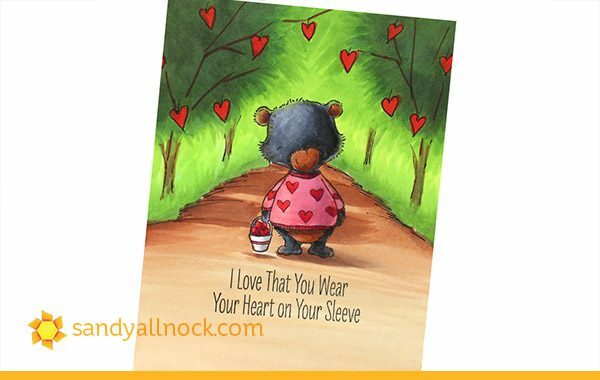 The sentiment is split – I stamped the left half, stamped the bear, then moved the card so I could add “with joy” at the end. 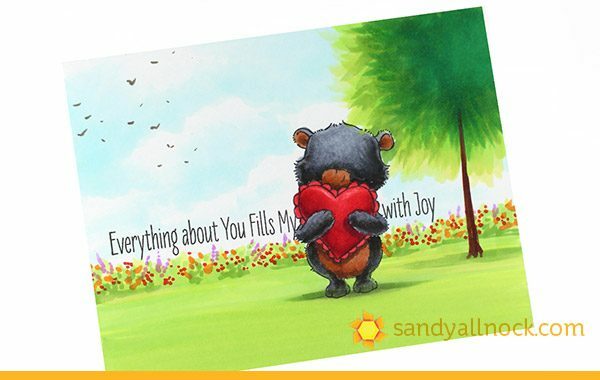 I hope it reads “Everything about you reads my HEART with joy…? This little bear was carrying a bucket full of hearts, so I put her in a heart orchard for picking them! I considered perhaps a strawberry-bed, which would also work with this stamp. 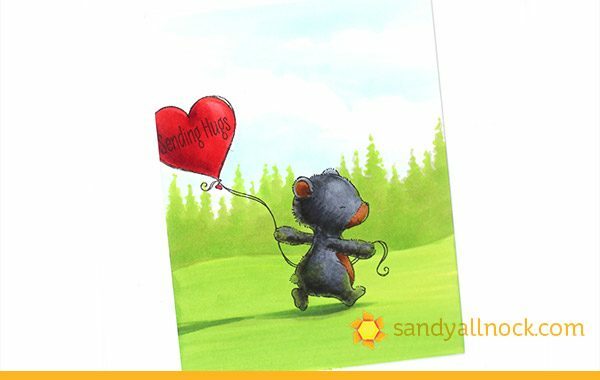 The little bear flying a balloon like a kite needed a big wide field to run in! 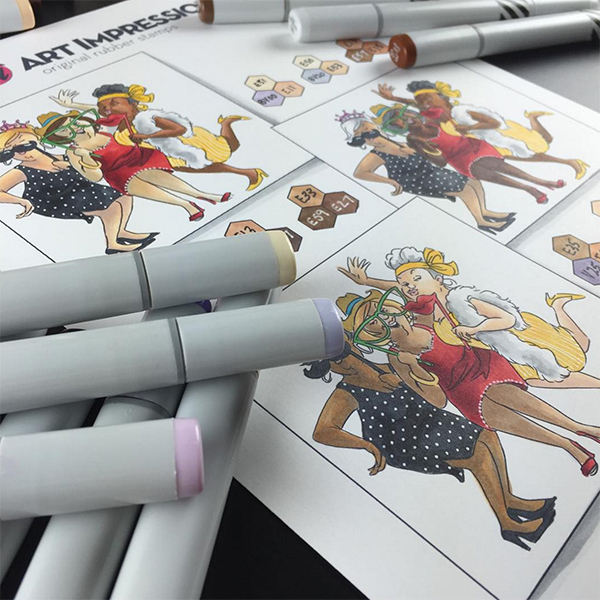 In some of the shading classes I taught last year, I create shading map handouts for my students – basically loosely sketching in the location of shadows on the stamps the students would be using for their class work. 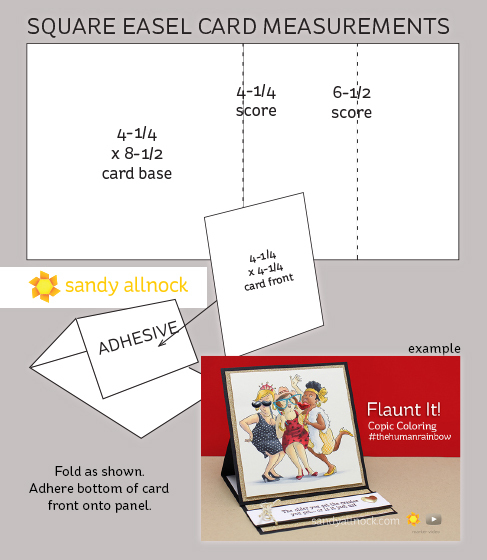 The handouts were crazy popular – and I thought it might be a fun feature to have here on the blog from time to time! How often? It won’t be every release for every company, of course. As I’ve said before, I turn down offers to receive freebies on a regular basis, as 1) I just can’t use that many stamps (lol), and 2) buying my own stamps keeps me sharing what I love, not what I’m given! 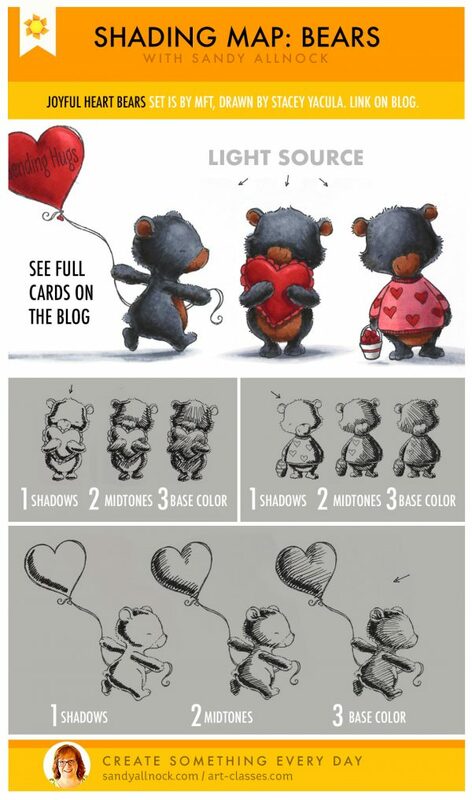 But sometimes I’ll say yes, and when I thought about using them as an opportunity to teach shading….I figured it’d be ok. You can click on the pdf and print it, then save it to cut into strips and slip into your stamp storage so you have it for reference. I won’t be creating videos for all of these Shading Maps – but I did post one today, just to let my YT-only followers know about it. In the future I may just do a blog post like this one – showing you the shading maps plus a colored image from each set. Just coz I can’t stand to not color them up when they’re cute, right? Okay okay. Now I’ll shaddup and you can check out the video below, or click HERE to see it in HD on YouTube! 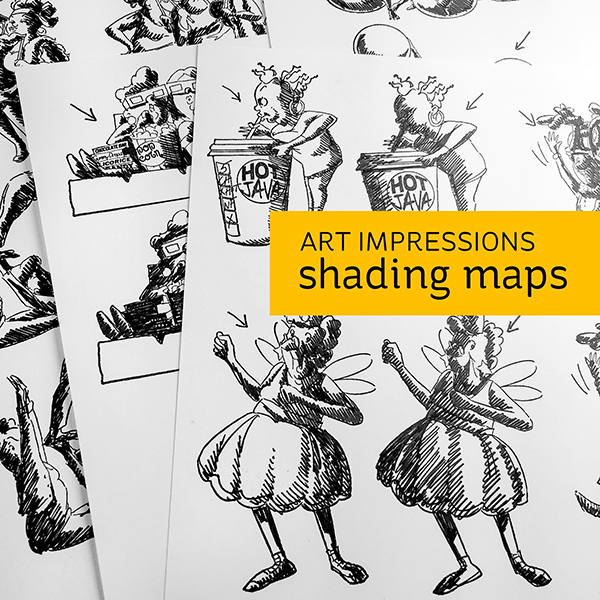 Scroll down to get the link to the Shading Map pdf! 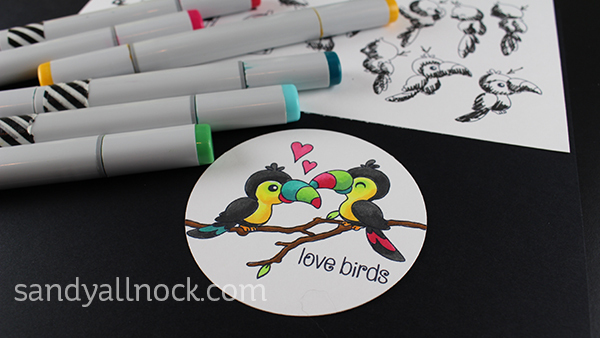 The little birds and toucans in this set are very sweet lil tweeters. Check out photos of birds in the Amazonian jungle for ideas on colors! 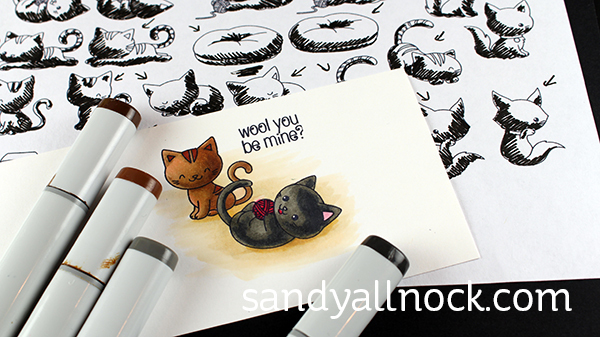 The You’re Purrfect set has lots of kitties to color – so tiny, so darling! 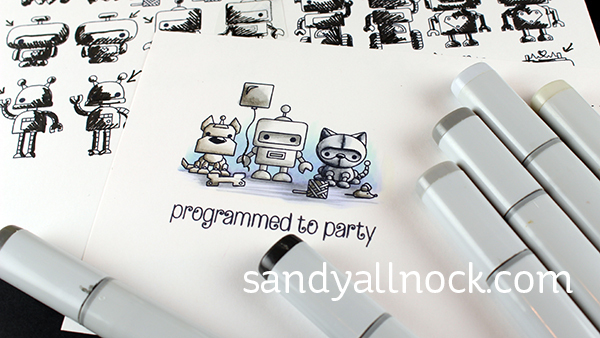 What could be cuter than puppy and kitty robots? SQUEEE! 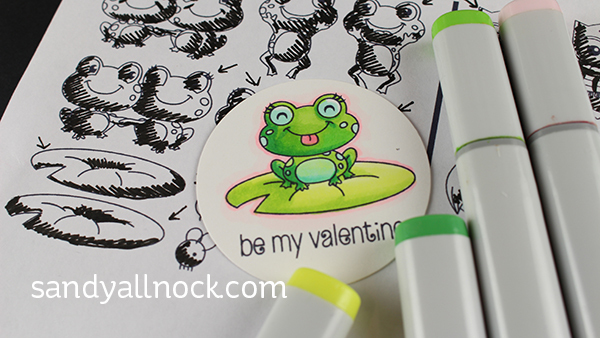 The little froggies in Jump for Joy will be cute for valentines, or for most any other theme. Add on a party hat or balloon from another set and dress them up! Owls are back too, and dressed up for the new year – scarves, ties, and bows galore! And if anyone was afraid the elephant craze was over – fear not! You haven’t missed the boat. 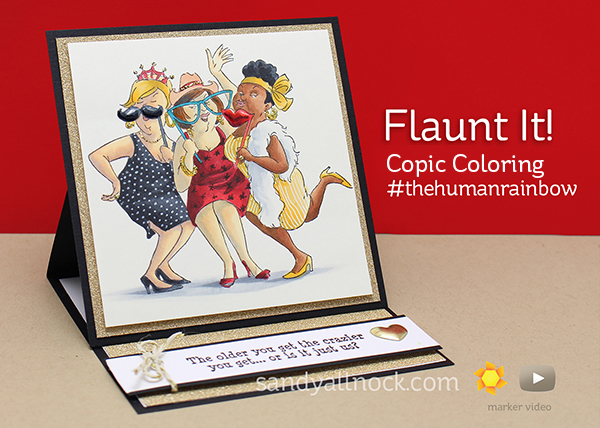 This one will be great for Mother’s Day and Father’s Day cards. And the shading maps? 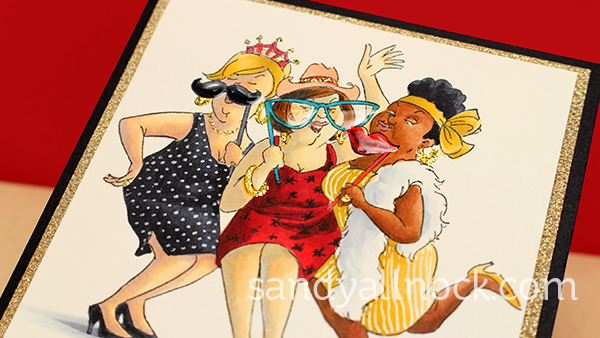 They work in watercolor, or any medium! 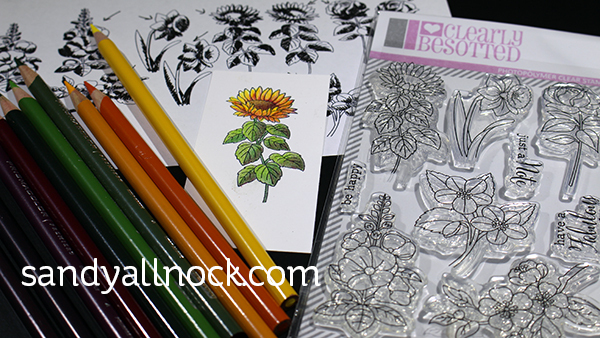 This flower set has some super tiny yet very detailed flowers – I thought they’d be perfect in colored pencil. I think I was right! I don’t know how regularly I’ll be doing these – but periodically at least, as I get permission and stamps to create these with. I don’t want to upset any stamp companies so I’ll need to get their ok to do it. Let me know in comments if there’s a line in particular you’d like to see a Map for!